Today is not Robert Robinson Taylor’s birthday: That is June 8, 1868. 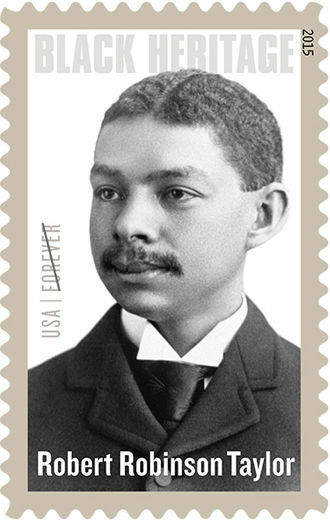 But we choose this date to honor him because last week, on February 12, 2015, in Washington, D.C., the United States Postal Service issued the 38th and latest in its series of Black Heritage stamps, and the subject is Taylor. This first class forever stamp is available in post offices now. Taylor was the first academically trained black architect in the U.S. and the first black graduate of the Massachusetts Institute of Technology (MIT). Born in Wilmington, N.C., Robert Robinson Taylor came from a middle-class family. His father, Henry, was the son of a white slave owner and a Black mother. The elder Taylor had been allowed to go into business for himself before the Civil War, building cargo ships for trade routes between the United States, the Caribbean and South America. He also built commercial and residential edifices. Young Taylor trained in his father’s building trade business and was admitted to MIT in 1888. He graduated in 1892, and almost immediately went to work as an architect and educator at the Tuskegee Institute in Alabama, which had been founded by Booker T. Washington. Taylor served as Washington’s second-in-command at the school. He stayed there until he retired in 1935, with only one interregnum from 1899 to 1902, when he worked on his own and for the architectural firm of Charles W. Hopkinson in Cleveland. Taylor designed most of the buildings built before 1932 at Tuskegee, including the original chapel and the library. Washington wanted Taylor to develop the industrial program at Tuskegee alongside the construction of new buildings. Taylor’s first building project on the campus was the Science Hall (Thrasher Hall) completed in 1893, and constructed entirely by students, using bricks made also by students under Taylor’s supervision. The project epitomized Washington’s philosophy of instilling in Tuskegee students, the descendants of former slaves, the value and dignity of labor, and of mastering practical trades. Tuskegee graduates were meant to provide an example to the world of African-American capabilities. Taylor also designed buildings in various other states. He collapsed and died at the age of 74 in 1942 while attending services in the Tuskegee chapel that he considered his outstanding achievement as an architect. He was buried at the Pine Forest Cemetery in Wilmington, N. C.
The Robert Taylor Homes housing project in Chicago was named after his son, also an architect, civic leader, and former Chairman of the Chicago Housing Authority. Robert Robinson Taylor is, coincidentally, the great-grandfather of Valerie Jarrett, Senior Advisor to President Barack Obama.